I have a treasured collection of vintage aprons that belonged to my mother and grandmother. It amuses me to wear one whenever I make a vintage recipe. Today, leftover turkey inspires a knock-off of my mom’s Chicken Tetrazzini. Donning my grandmother’s little gold apron with the appliqued turkey, I assemble the ingredients. So many vintage recipes have disappeared in time and I think the longevity and popularity of Chicken Tetrazzini is due, in part, to turkey. During the holidays folks often wax nostalgia, yearning for childhood favorite dishes. Chicken Tetrazzini segued to Turkey Tetrazzini, satisfying that comfort food craving while tidily taking advantage of the leftover holiday fowl. My mother’s tetrazzini recipes calls for an additional 2 tablespoons of butter and 1 cup of half-and-half, enriched with a beaten egg yolk, stirred into the casserole right before baking. That adds a creamy rich flavor but I’m cutting calories now, saving room for holiday favorites around the turnpike. I also changed mom’s classic using smoked almonds instead of plain. Chicken Tetrazzini recipes often call for green peas, which would add color and a welcome nutritional boost. Preheat oven to 375˚. Bring a large pot of salted water to a boil. Cook noodles apx. 3/4 recommended time on package instructions; noodles will continue to cook as the casserole bakes. Reserve. In a large sauté pan, heat oil and over medium heat. Add garlic, cook 1 minutes. Wipe mushrooms clean, remove woody stem and slice. 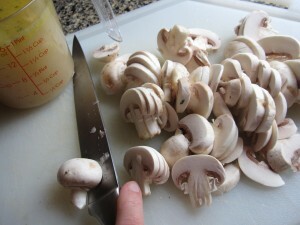 Add the mushrooms, thyme, a pinch of kosher salt, and saute, stirring, 3 minutes. Set aside, leaving 2 tablespoons juice in pan. Melt butter in pan and stir in flour to make a roux. Cook, continuously stirring, 2 minutes. Whisk in stock and wine, stirring vigorously to avoid lumps. Simmer 5 minutes or until sauce is thickened and smooth. Add the mushrooms, turkey and reserved pasta; combine. Spoon the mixture into a buttered 9 by 13-inch baking pan and flatten with a spatula or spoon. 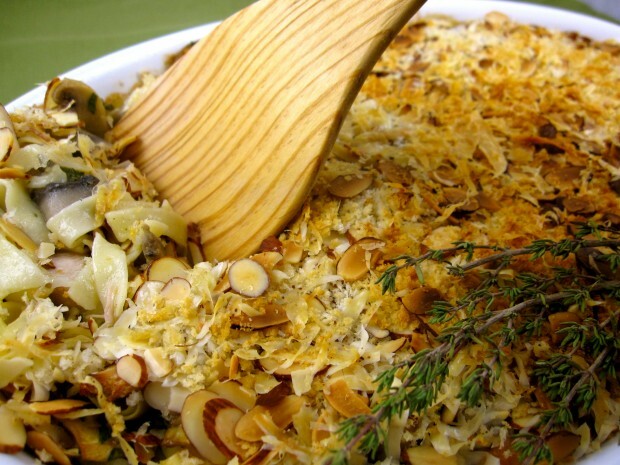 Combine panko, Parmesan and almonds and evenly sprinkle over top. Bake on middle rack of oven until the sauce bubbles and a top crust has formed, 25 to 35 minutes, rotating casserole after 15 minutes to insure even baking. I don’t see an oven temperature. Would 350 degrees F. be about right? Congratulations on the new website. It looks great.